Mad Cat Theatre opened Paul Tei's adaptation of a Molière play, Viva Bourgeois, on Friday, July 24, 2009. Tei directed a cast that includes Erik Fabregat, Joe Kimble, Erin Joy Schmidt, Troy Davidson, Caitlin Geier, Mathew Chapman, and Betsy Graver. Only a mind like Mad Cat Theatre Co.’s Paul Tei, steeped in both the classics and pop culture, could have come up with Viva Bourgeois! ...historical parallels as justification are almost unnecessary as soon as company member Erik Fabregat lumbers onstage, stuffed into a gleaming white pantssuit, and opens his mouth, emitting a pitch-perfect Southern drawl. He is Elvis, to an extent that may actually get in his way on future performances in other projects. And when he steps to the microphone and sings -- original faux-Elvis ballads by the cunning Matt Corey, set to lyrics lifted from Moliere’s text -- the impersonation is complete. Particularly amusing is Joe Kimble in two vastly diverse roles as a curly-headed Music Master and, later, a mercenary senator. George Schiavone’s Philosophy Master is strictly beatniksville and Erin Joy Schmidt is aptly shrewish as Jourdain’s appalled wife. Le Bourgeois gentilhomme still feels like sharp social commentary, but when pulled from the context of 1670s France, its exact targets become difficult to parse. Is petty striving the object of contempt? Or the unsatisfied middle class? ...this is now a play about Elvis, the soul-cracker of Beale Street who would one day himself be compared to the Sun King. The idea is so obvious, so perfect, that Tei must have giggled like mad when it first occurred to him. Of course! Mr. Jourdain is Elvis! Playing Mr. Jourdain/Elvis is Eric Fabregat — a good-natured, game, and goofy actor who is also the only South Florida thesp who could have done this role any justice. Looking a little more like Roy Orbison than Elvis, he nevertheless nails it. First among equals is Erin Joy Schmidt, playing Mrs. Jourdain/Priscilla Presley, who brings both down-home country sass and even-headedness to the chaotic Graceland, where she's beginning to feel less and less at home. Notable too are Caitlin Geier's bubbly, lusty incarnation of Mr. Jourdain's daughter, Lucille, and Troy Davidson's performance as Leon, Lucille's dancing, singing suitor. Brandon does feel that the script needs some work: click through to read the entire review for that, and some analysis of the adaptation. Tei's quirky, original sensibilities go full throttle with the latest Mad Cat production, Viva Bourgeois. As the company's artistic director, he's once again created a show that's entertaining yet substantial. As a writer, he's adapted a French classic by Moliere, finding commonality between a fictional, 17th century character and Elvis Presley. As a director, he's assembled a cast of Mad Cat regulars and new faces who form a tight ensemble, and a team of designers who turn Mad Cat's scrappy, office building space into a complete, sensory experience. He also throws a great opening night party, in this case, complete with Elvis Presley's favorite foods, whipped up by his mom, Anne Tei. Erik Fabregat channels the King of Rock and Roll right into Mr. Jourdain. He's got the sneer and the quiver down, and he wears Elvis's iconic white polyester suit perfectly. Although Mr. Jourdain is often a buffoon, Fabregat's funny and touching performance turns him into a tragic, poignant figure. Davidson's performance is as infectious as his laugh, and he does a mean Michael Jackson homage. Schmidt is wonderful as Mrs. Jourdain, a down-home voice of reason, and Graver is all sass and attitude--let's call it sassitude--as the Jourdain's maid. Perhaps one of Tei's greatest accomplishments is that everyone involved with the show looks like they're having as great a time as the audience. Viva Bourgeois is a free-wheeling ride, a 20th century Moliere for a 21st century audience. Don't miss it. ...it's a bizarre premise: picking up Le Bourgeois Gentilhomme, Moliere's 1670 satire of middle-class greed for social standing, and plopping it down in 1971 Graceland with Elvis as the buffoon who chases genteel respectability with a bulldozer. 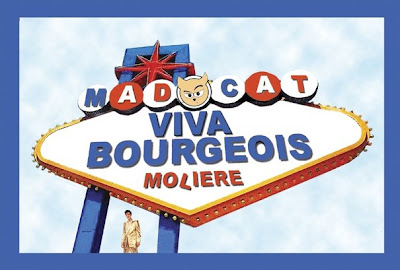 But Paul Tei and his anarchic Mad Cat Theatre Company transform this classic into a hilarious evening called Viva Bourgeois! featuring Erik Fabregat in one of the funniest performances this year as The King after he discovered carbohydrates. The cast's wackiness and the enthusiasm over their performances is infectious, especially the chameleonic Joe Kimble as a hippy-dippy songwriter and doubling as a venal politician hitting up Elvis for a loan. Mad Cat Theater's production of Viva Bourgeois plays Thursday through Saturday evenings at The Miami Light Project, through August 22nd.